The Wild Pride Slot is a Booming Game powered video slot machine games with 10 pay-lines and 5 reels. The game is inspired with the magic of Safari and wildlife. It is filled with exciting features and imagery, but the real stars of the show are the female and male lions. In the background of this Great slot game, you will see a sunset image with yellow and orange sun rays forming shows on the African plains and silhouettes of mountains, plants and animals adding the atmosphere. The Wild Pride slot has a range of features including scatter symbols, interactive lion symbols and free spins bonus round which award special bonus payouts and animate when they appear on neighboring reels. To head into the African sunset, you will need to place a bet. First, you will need to choose your stake for each payline. It usually starts at 0.01 and goes up to 10 to give a minimum stake of 0.10 and a maximum stake of 100 per spin. All the 10 paylines are usually in a fixed position to increase the number of ways to win a single bet. Press the “autoplay” button to play spins automatically. This will make your gameplay convenient and smoother without the need for pressing the “spin” button every time. Another way to go about this is to press the “bet max” button to easily place the maximum bet. You can also include a full screen mode and an “info” button to open the paytable and study the symbols and their possible payouts. This slot has a scatter symbol that can trigger the free spins round. You will take advantage of 10 free spins, and in this round, your payouts will get a 2x multiplier reward. And if you spin extra scatter symbols in this round, you will be taking advantage of more free spins, and with every win being awarded an additional 2x multiplier. 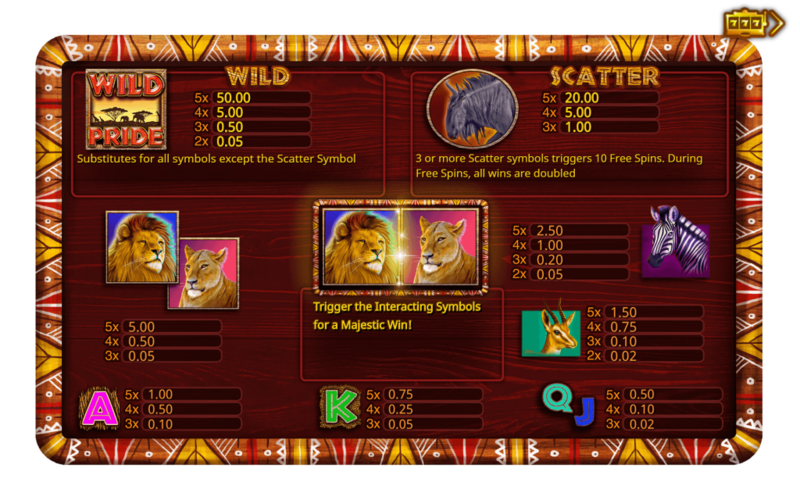 Another exciting feature about this slot is the interacting symbols which are two lions. If you manage to hit these symbols next to each other on neighboring reels, you will be able to trigger a bonus boost and their special animation. This feature creates an exciting moment and adds to the theme of the games-something that you should look out for when playing. This slot has a low variance level. This means that it awards many small regular payouts. This is unlike other games that have an average volatility rating for higher payouts. Wild Pride Slot is the perfect game for people who love nature inspired slot games and wild themes. Playing this game will give you a chance to enjoy the dramatic atmosphere and vivid imagery, while the features offer many different ways to win. This slot’s low volatility is ideal for lower rollers who prefer many small, regular payouts. The sound effects and animations create a strong theme with atmosphere whereas the multiplier rewards and free spins regularly to offer lucrative wins on the savannah.